Our informal gathering at Weymouth proved quite popular, with 40-50 members attending for all or part of the weekend event. They included one member from the USA and one from Germany. We were very lucky with the weather, which was dry throughout in Weymouth, with a reasonable amount of sun; a cold wind blew at times, but it was nothing compared with two years ago. Not many people took advantage of the option of including the Friday in the event, so the majority of the activity took place on the Saturday and Sunday. The informal arrangement of meeting in front of the Pavilion at the end of the Esplanade, particularly in the morning and evening, worked quite well; specifying a more precise for meeting time might have been better - though from experience I doubt if people would actually have taken all that much notice of the agreed time! Why is Gary Lovell looking so miserable? His Brompton fell over and got scratched. Photograph: Graham McDermott. 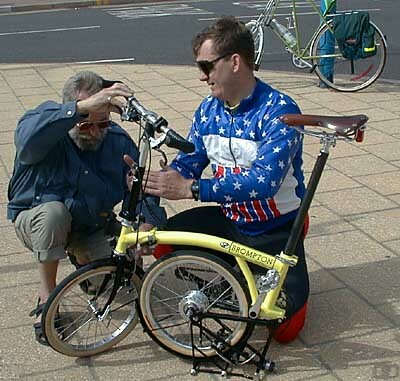 Steve Parry demonstrates some of his Brompton modifications to John Prince. ... and Chris Dent. Will either of these join the growing list of those who have ordered one of these modified Bromptons? 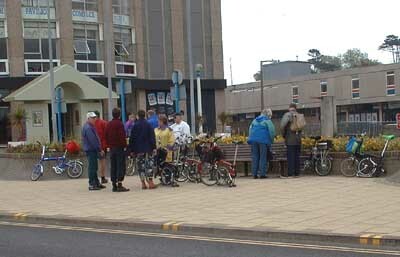 The system of people agreeing amongst themselves where to go, and going out in small groups was also quite successful - most people seemed to much prefer finding a group with similar interest and not having the problems which cycling in larger groups can create. The Saturday rides took in Abbotsbury, Litton Cheney, Maiden Newton, Upwey and various other places. A report on the Maiden Newton outing is also available on these pages. On Sunday we found the local Vintage Motorcycle Club had a meeting on the car park at the Pavilion, and this counter attraction delayed the departure of some people on their ride. Once again we split into smaller groups for riding, the majority opting to go to Portland., though some people chose shorter rides. 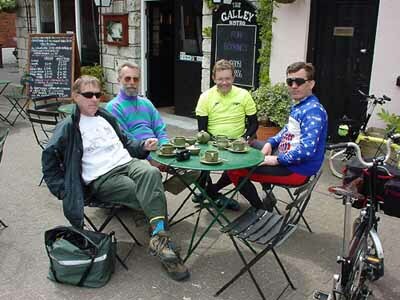 The first Portland group of 9 riders set off before the motorcyclists left the car park, a further 6 deciding to wait to see the motorcyclists set off before departing for Portland. The first group was lucky to be led by Lillian Maton, who lives in Weymouth and used her local knowledge to show us a quiet ride up through Fortuneswell which was not as steep as the other routes we had tried, and included some excellent views. Unfortunately her husband John was not able to join us as he was suffering from back pain. After refreshments at Portland Bill, where the two groups met up again, people gradually made their way back to Weymouth, the length of their stop being influenced by their travel arrangements for getting home afterwards (the majority as usual had opted for train travel). A small group of survivors, who were not leaving until Monday, met at the bar on Sunday evening. 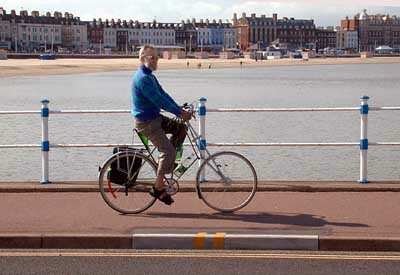 John Prince rides his separable Pedersen along the Esplanade. John had also brought a Brompton which he used for most of the event. The predominance of Bromptons was particularly marked at this event, after a stronger showing of other makes last year at Ventnor. The only non-Bromptons we know of were a Bickerton, a Bike Friday New World Tourist, Tandem Two'sday, 3 Birdys, a Fold-It, one Moulton APB, a separable Pedersen (used by John Prince for part of the event) and a modern large-wheeled folder used by Derek Baker (sorry - I did not note the make). 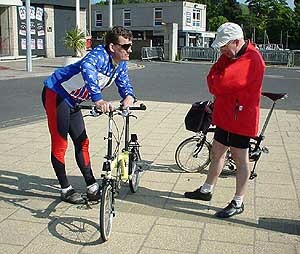 Steve Parry had his much modified Brompton (described previously in our web pages), and Peter King's Brompton also had received a similar conversion - these two bikes attracted most interest. Steve had added a modified rear carrier with a quick release block mounting allowing another Brompton front bag to be carried at the rear, with very rapid removal (using the bracket that Steve has developed a bar bag can be substituted at either the front or rear, when the larger bag is not needed. 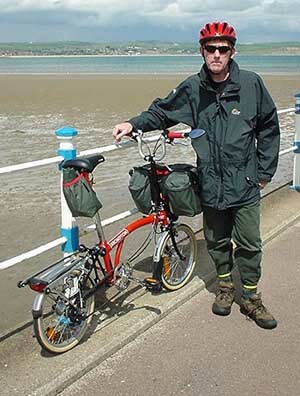 Peter Henshaw has also ordered one of the Steve Parry modified Bromptons. and another member was also in the process of placing an order, with at least two showing hovering. 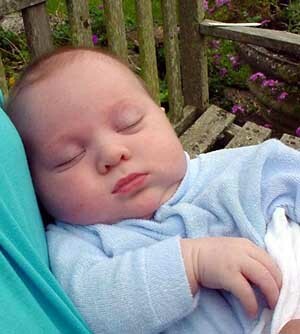 Steve was due to visit Brompton immediately after the gathering to show them what he has done. 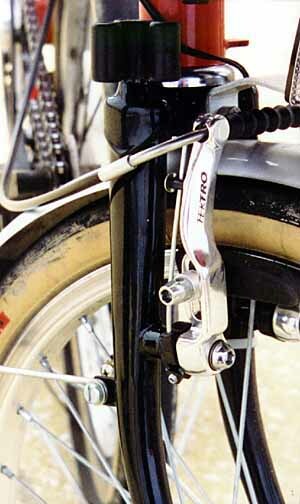 The Brompton from the USA had V brakes at the front only, but used a rather interesting version with short arms. I was due to leave at 12.50 on Monday, so, having an hour or so to kill in the morning I decided on a short ride, but as a result of taking a wrong turning I found myself cycling towards Dorchester. As I was riding along I saw a cyclist leaning against a lamppost, who waved me down. He needed help, his back having gone, and he could barely move. While I used my mobile phone to send for an ambulance I discovered he was John Maton, Lillian's husband, and a member of The Folding Society (though riding a conventional bike on this occasion). I am sure we all wish him a speedy recovery. Many thanks to all of you who came to the gathering and helped to make it successful - I hope you all enjoyed the weekend. Decisions, decisions! What was I going to take to the Weymouth gathering? Well, apart from a few clothes there were quite a lot of other things required for the event - paperwork relating to The Folding Society, a few copies of "It's in the bag! ", cameras, and the computer with membership details. This amount of luggage ruled out the Birdy, and would also have been a problem with the Brompton as I have now removed the rear rack, plus the fact that the Brompton gearing is not ideal for the fairly hilly area with a load. The Pocket Rocket a bit too high geared when loaded, so I decided I would have to reassemble the NWT. The powder coated parts were collected on the Monday afternoon and assembly was done on Monday and Tuesday evenings. A quick test ride was made round the block on a rather showery Wednesday, a few final adjustments were carried out and seemed OK. Normally I would like to do a bit more testing before embarking on a five day outing with a bike, but I decided to risk it. 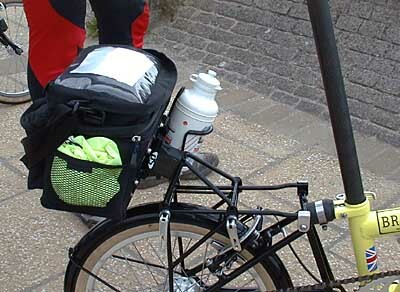 Everything was loaded into two universal (ie fairly small) panniers on the rear rack, plus medium-sized bum bag. During the event the NWT performed very well, and the new V-brakes make an enormous improvement to its performance. However, I had forgotten just how big it is when folded until I reached Birmingham New Street and had to carry out the operation on the platform. The resultant package is quite a problem to stow on the train - it would not fit into the luggage shelves at the end of the carriage, and when placed alongside them it tended to impede inside door operation, particularly as it does not stand very well when folded. On most trains I put it in the area near the outside doors, but when the platform is on a different side at every other platform this means rushing along to move it each time the train stops. Apart from the brakes, the only change from its previous specification was a modified stem, lower and with a slightly longer reach. This certainly suited me better than the original stem. With its 20 in wheels and City Jet tyres the bike rolled along very freely, and felt very stable, coping very easily with the load on the rear rack. The 3x7 gearing also made hill climbing quite painless. However, the more awkward folding and larger folded package did mean that when at the end of the day the Brompton owners carried their machines into the pavilion for drinks and a meal, I opted to return to the B&B and carry the NWT up to my room - with some difficulty, as the staircase was rather narrow! With all the modifications, and hand fitting, the cost of the complete set of modifications and the bike is around £1200. Although this makes it more expensive than the cheapest Bike Fridays and most of the Birdys, it is still a very attractive package. Few would dispute that the Brompton folds more effectively than either of these bikes, or indeed virtually all other folders, and Steve's modifications do not in any way detract from the folding performance. The Brompton also has one of the best luggage carrying systems around, and again Steve's modifications in no way detract from these capabilities - indeed, with the additional special rear rack for the front bag (a further £100) the Brompton becomes an even more convenient luggage carrier. While a standard Brompton rides remarkably well, most people find the riding position less than ideal, the braking rather unimpressive, and the gear range/spacing a little limited. Steve's modifications address all of these areas, and make the Brompton even more versatile. Steve's modifications therefore retain all the strengths of the Brompton design, and also keep the character of the original machine, but they address the areas where the Brompton is less attractive for those who want to extend its usefulness. Steve Parry's latest modification - a new rear carrier which allows a small subframe with a Brompton mounting block to be used. The subframe is held in place by quick release catches, so that it can be removed speedily when folding the bike. 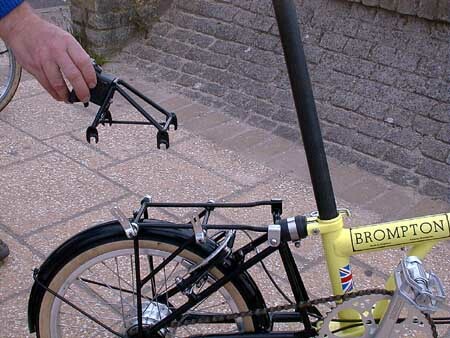 The standard Brompton block can be used to mount a normal Brompton front bag, or, as shown in this picture, other types of bag such as this bar bag, using the mounting bracket me have mentioned before. I have a Brompton and a Friday (plus of course several Moultons), and bought a Birdy about a year ago. Had Steve's modified Brompton been available then I would have had one of these rather than the Birdy. It would have meant one bike could do the job of both these bikes, and the modified Brompton would have surpassed the Birdy in every department, except possible off-road. I am eagerly awaiting delivery of my SP modified Brompton. By the way, Steve has decided that he will generally only do the full modification in future on new bikes, as existing modifications made by owners and older specification bikes can cause problems. If you want to contact Steve to discuss this interesting machine, or find out if your Brompton is new enough to be modified rather than start with a new machine, you can reach him on. More photographs from this event are being put into our gallery pages.